1) Aung Thukha Restaurant (close to Shwedagon Pagoda). 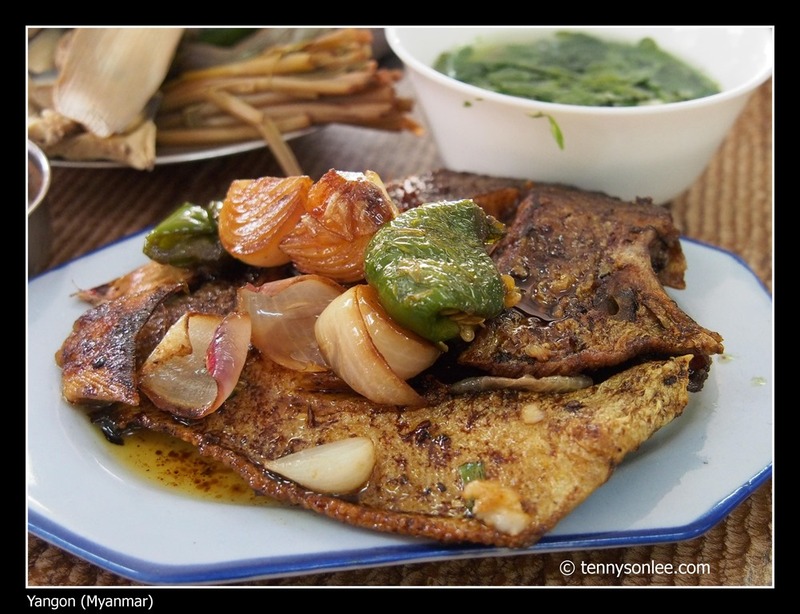 Excellent quality and lowest price we ever eaten in Yangon. Next to our table was a group of Shan tribe folks and monks (monk can eat in non-vegetarian restaurant). You can check out the rating from Tripadvisor. 2) Danuphyu Daw Saw Yi Myanmar Restaurent (No. 175/177 29th Street). 29th Street is a small lane (SPA Building would be a good landmark). There is a restaurant named Penang Restaurant but not serving Penang food on the same street. Many other good choices of Muslim halal food on 29th street. 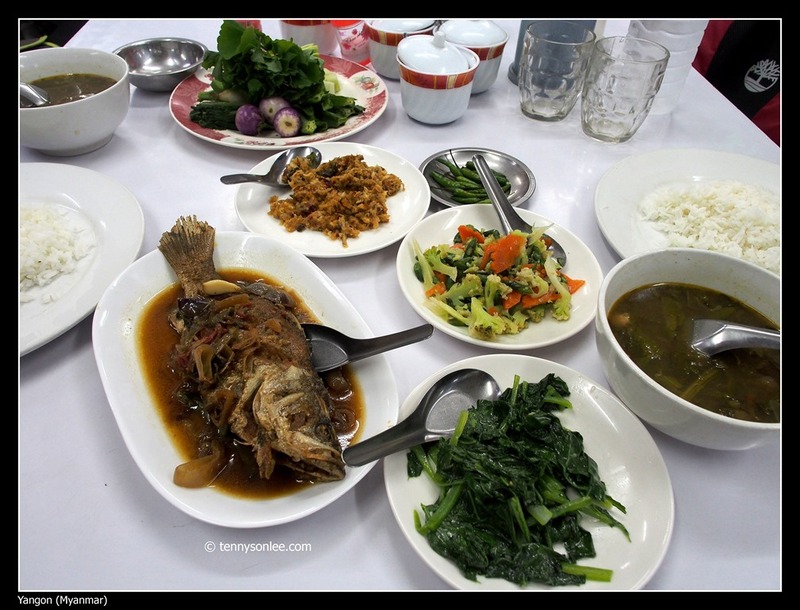 We ate in both Restaurants for 1 fish + 3 dishes, the bill was only 5,500 Kyats (about USD6). One good way to differentiate the cost of a restaurant is to look at the price of Myanmar Beer or mineral water. Tea house is like the Malaysian Kopitiam (coffee shops). They are great spots to take a rest. Chinese tea is always served free. Tea & coffee comes to about 600 Kyat (2 cups). 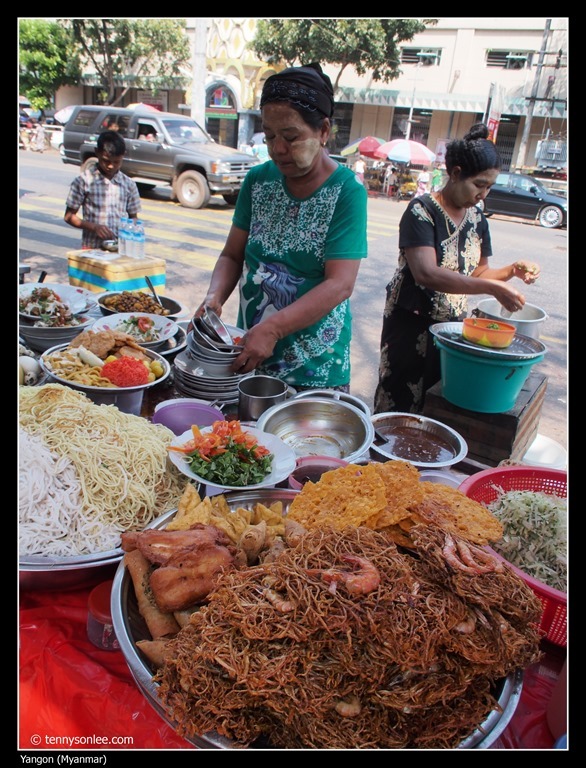 Shan noodles and mohinga are the ‘must try’ Burmese foods. We ate mohinga in hotel as breakfast. I like the texture of the crunchy crackers. 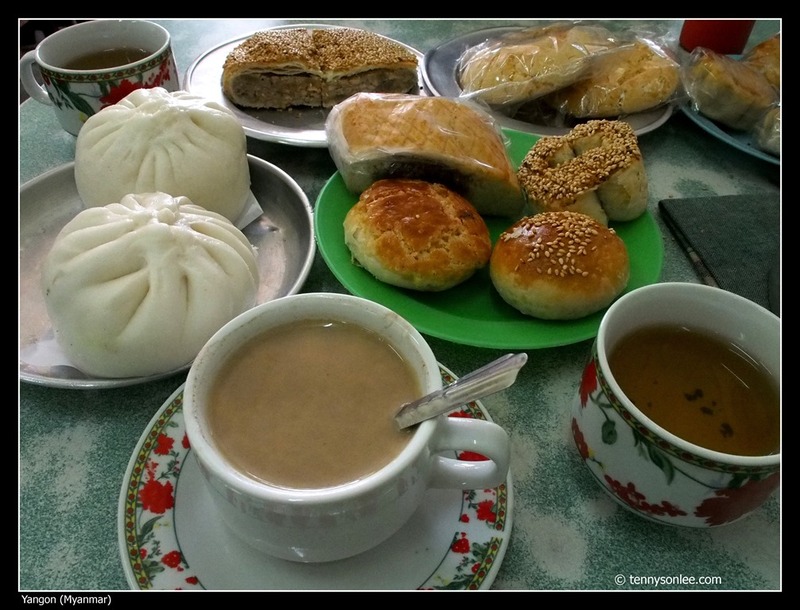 It is only served as breakfast in Myanmar. 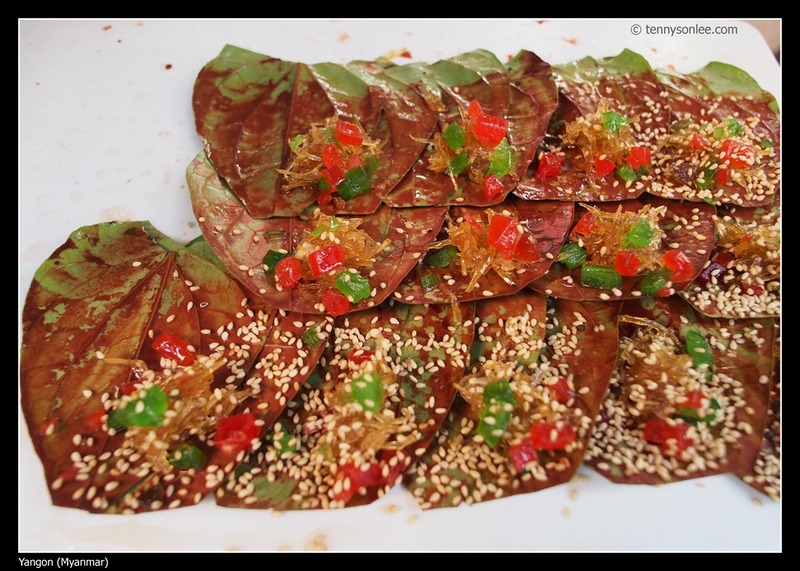 We did not gotten the chance to taste the green tea salad on this trip. 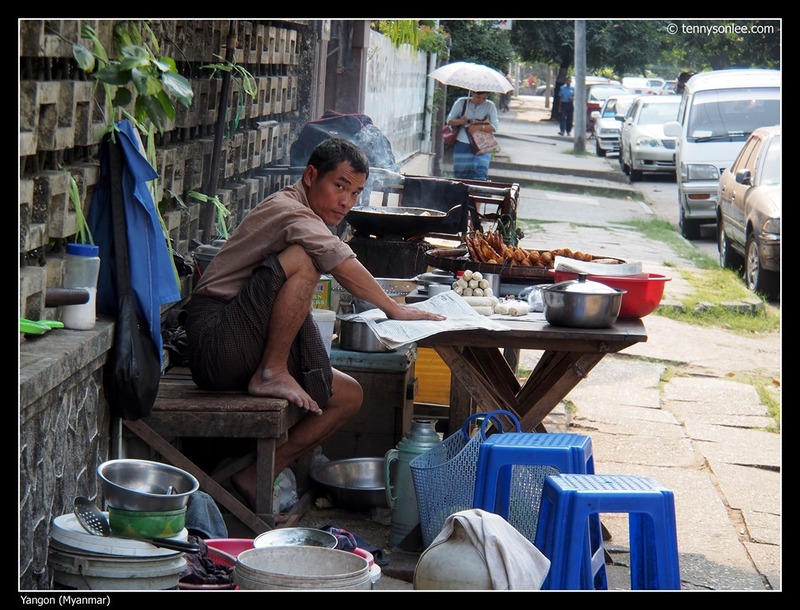 Like the Vietnamese food stalls by the roadside. Chairs are kindergarten style tiny stools. 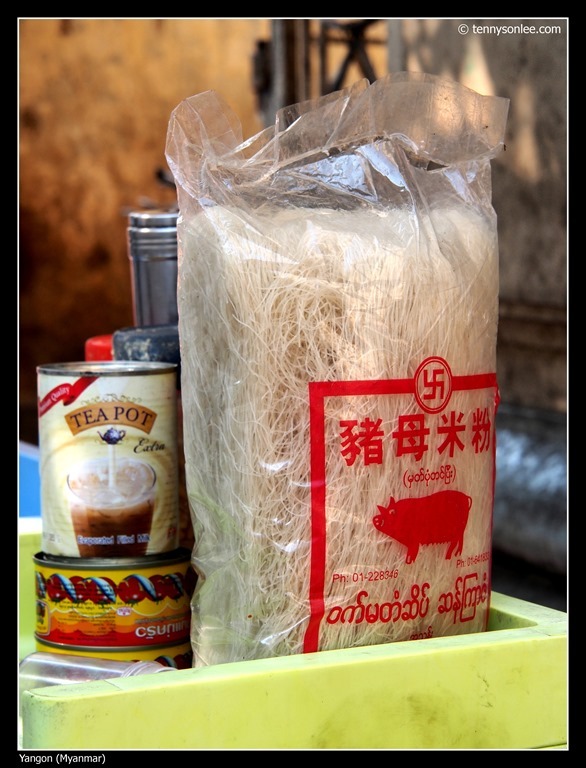 Noodles were covered with mosquito net to shield it from the flies. Drinks are mixed with condensed or evaporated milk. This brand of rice noodle can hardly sell in Malaysia (because the brand name itself is non-halal. Just joking). 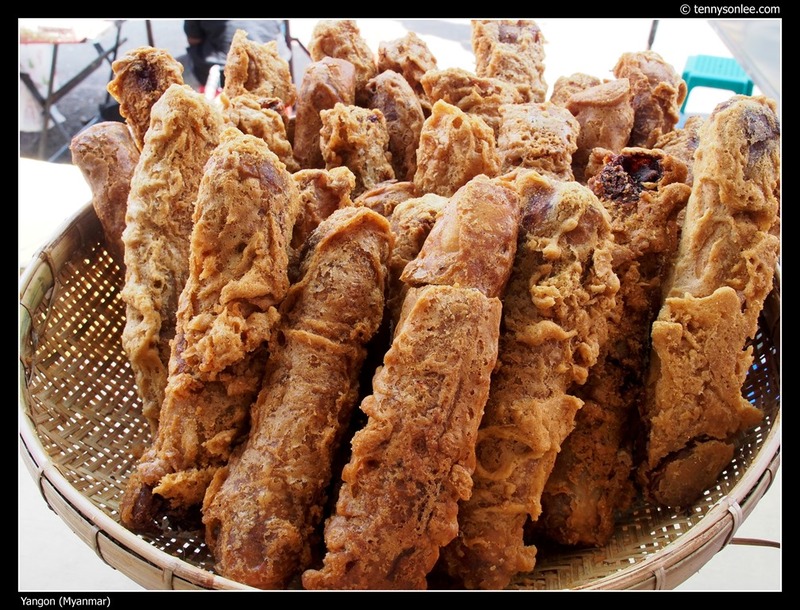 Deep fried is the most common cooking method. Most of the fried foods smelled tempting but after looking at the colour of the cooking oil, we lost our appetite. This vendor outside our hotel area has been ‘slow boiling’ spring roll, instead of deep fried with high temperature. 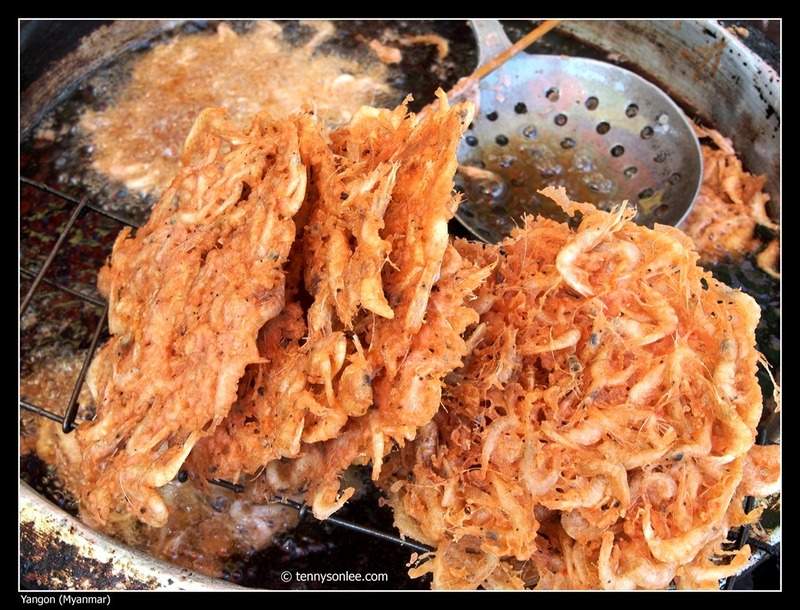 It is just different way of cooking but slow fried absorb more oils into the food. If you order food in the restaurant, do take note that item like ‘fried steak with pork’ means stir fried beef and pork. So feel free to order ‘fried vegetable’ which is not deep fried. 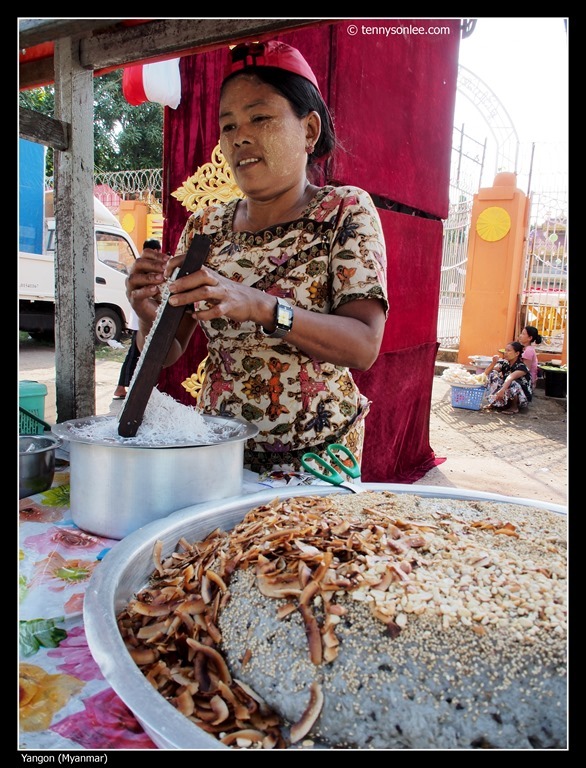 One of the habits of Burmese disliked by some tourists is eating betel leaves and nuts. Calcium Hydroxide (lime) and other additives are added for flavouring. 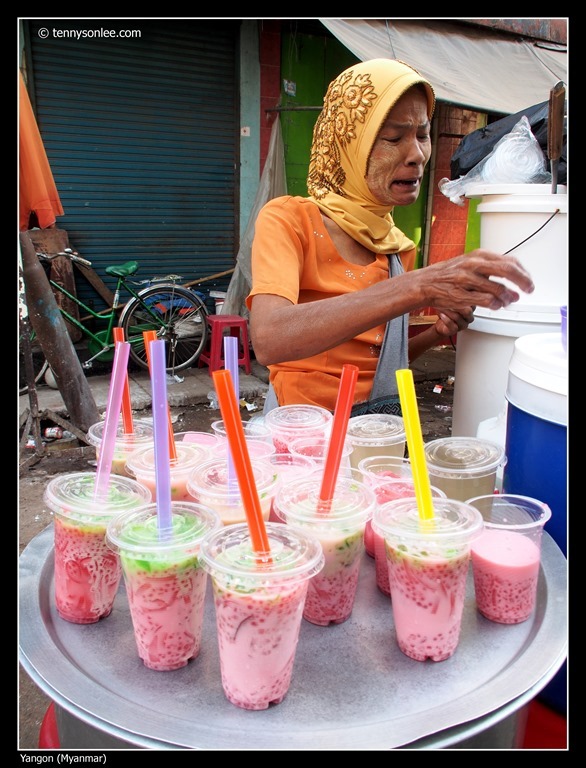 You can notice many men and elderly ladies have the additive habit of chewing betel. Drivers and pedestrians were spitting rampantly onto the street (where everyone has to remove their shoe onto the temple ground). 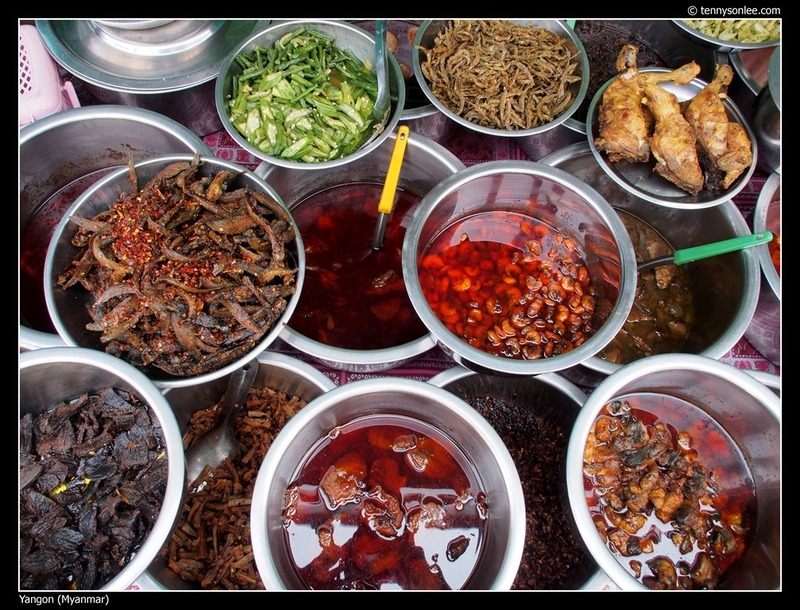 If you are looking for food in Chinatown, you could be disappointed. Unlike other Chinatown, there are very few Chinese restaurants in old town. Most of the Chinese restaurants are near tourist attractions, and few offers steam boat (I do not understand why steam boat is popular in Myanmar warm climate). 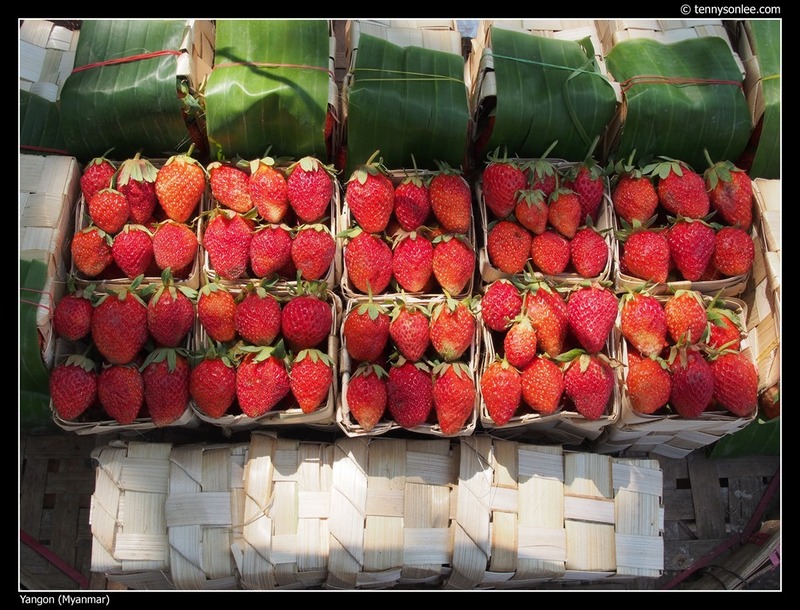 Fruits like durians, apples, pineapples and bananas are available. The strawberries have more interesting packaging. 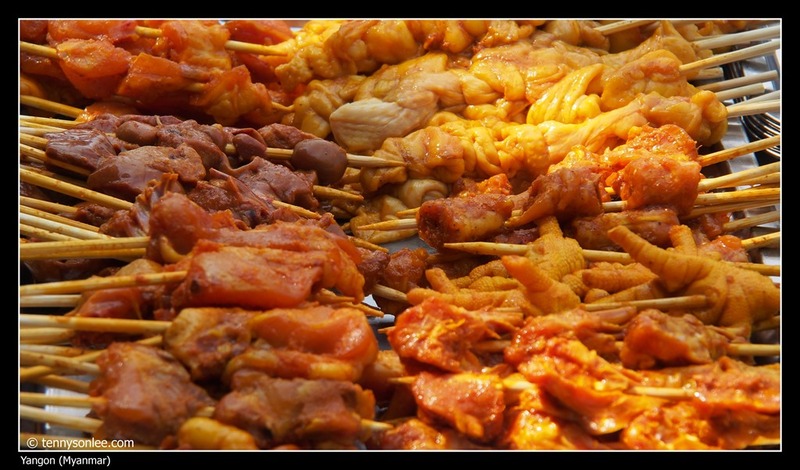 Some of the street foods look very tempting. The lady was shaving coconuts and to be added to the sticky rice. 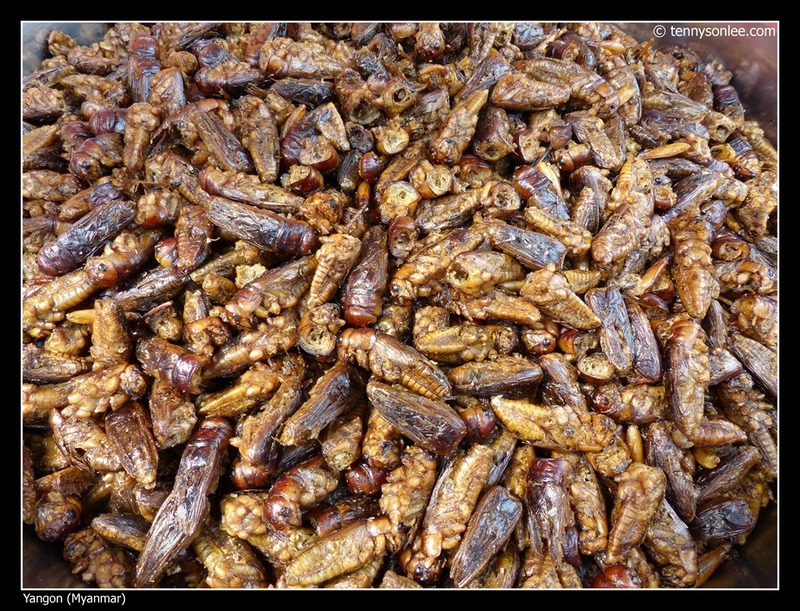 We had this snack in Bagan, it tasted fairly good. 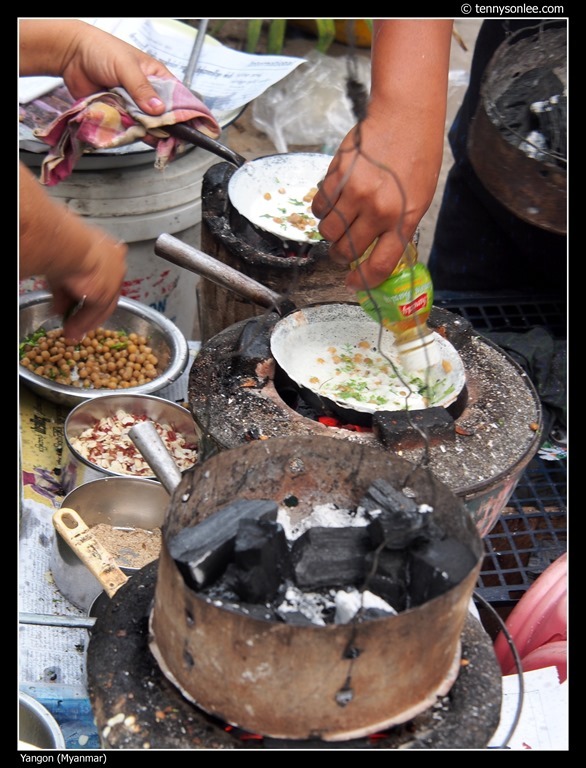 The pancake was cooked with charcoal covered on top after sprinkling beans and some oil onto the flour. There are many foods stall around Bogyoke Market. When I took photo of the berry jam, a fly maggot crawled out from the berry. The vendor still asked me “want some jam?”. 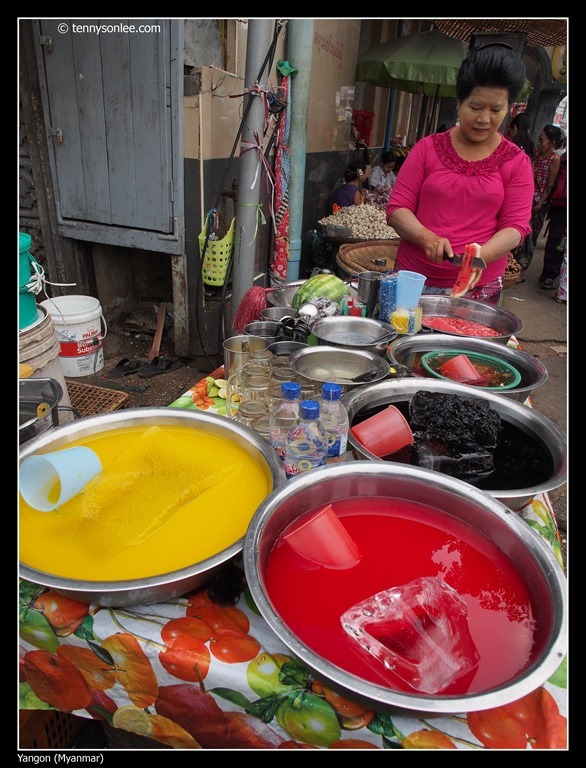 All the picture of the foods were taken in Yangon. 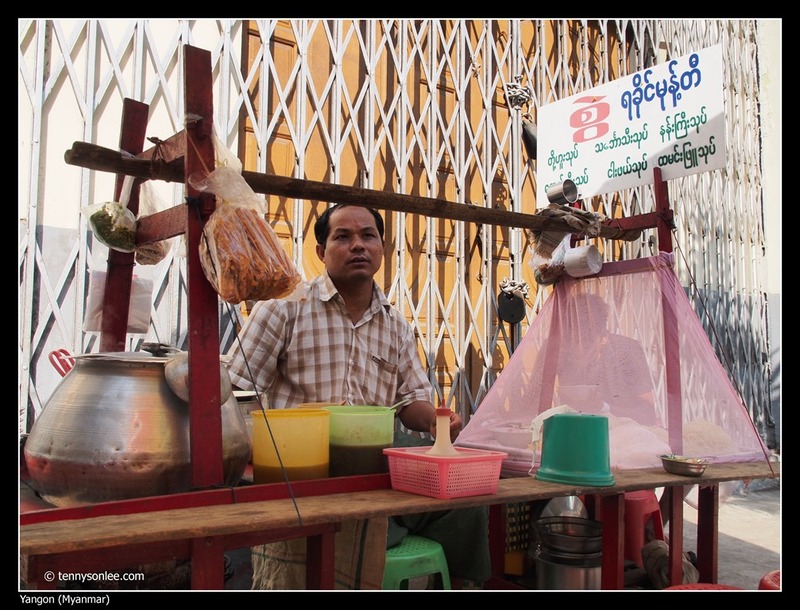 If you are visiting New Bagan, I would recommend Kaday Kyaw Restaurant (next to the stupa on the main road). Its Myanmar Beer was cheaper than sundry shop. side note: The price of Tiger Beer is cheaper than Malaysia to due heavier tax in Malaysia. This entry was posted on February 18, 2013 by Tennyson. 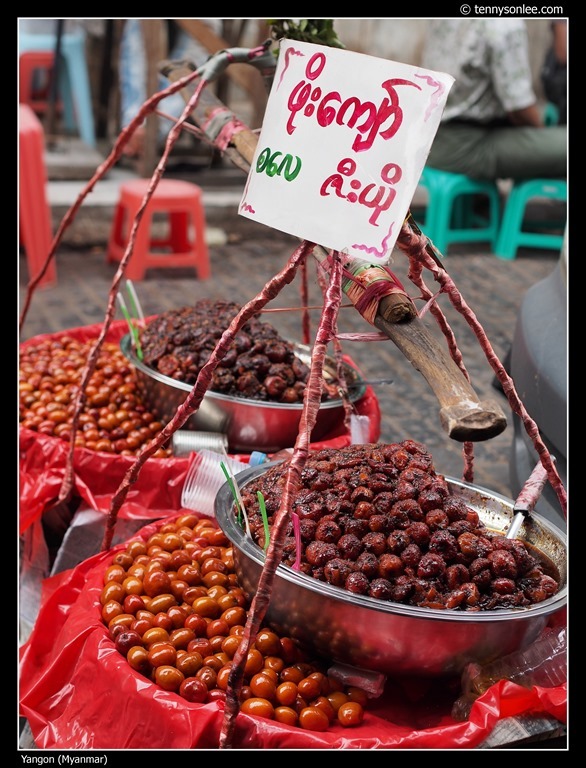 It was filed under Food, Myanmar, Street, Yangon and was tagged with Burmese cuisine.